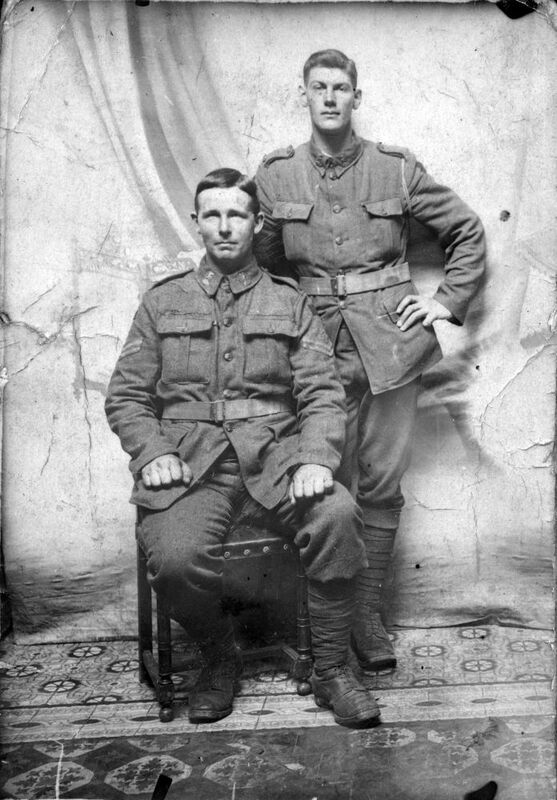 Bill Nielsen (standing) and Thomas Denbee (Carterton), both of 2nd Battalion, New Zealand Rifle Brigade, at Armentieres in June 1916. Denbee was killed soon after on 19 July. Bill was the son of Matarawa farmers Niels and Sophie Nielsen, born in 1894. Along with his siblings he attended Dalefield School before becoming a farmer in the area. The New Zealand Rifle Brigade, a new infantry unit with no territorial location, was formed early in 1915 and Bill enlisted into its 2nd Battalion, service number 24/1146. Training began at Trentham Camp but the health scares of July 1915 sent Bill and his mates north, first to Manawatu then to Tauherenikau Camp. He set sail on 9 October 1915 to Egypt as part of the 7th Reinforcement. The Rifle Brigade joined a small war in the Egyptian Desert against the Senussi, a sect supported by Turkey and Germany, after which, as part of the New Zealand Division, Bill sailed to France in April 1916. The Division first went into the line at Armentieres, a ‘nursery’ sector of the Western Front, where the men acclimatised to trench warfare. Bill was slightly wounded on 19 July but stayed with his unit. Soon after, the Division moved south to add its weight to the Battle of the Somme which had begun on 1 July. The New Zealanders first entered the fray on 15 September, attacking Flers during the third phase of the drawn-out fight. They made several successful but costly attacks. Bill’s unit was called again into the line and led an attack on Flers Support Trench on 1 October. It was during this fight that he received a shrapnel wound on his left leg which removed him from the battle. He began the long journey to the rear which ended with him in the New Zealand hospitals at Hornchurch and Walton-on-Thames for a long convalescence. Finally in April 1917 he was ‘boarded’ unfit for service, with a leg wound and chronic rheumatism. He came home to New Zealand on the hospital ship Marama in July and was discharged from the NZEF in November 1917. Bill resumed farming and married Dorothy Bicknell in 1919. They had five children. After Dorothy’s death, Bill married Millicent Dendy and they retired to Paraparaumu. Bill died in 1974 and is buried in Clareville Cemetery.